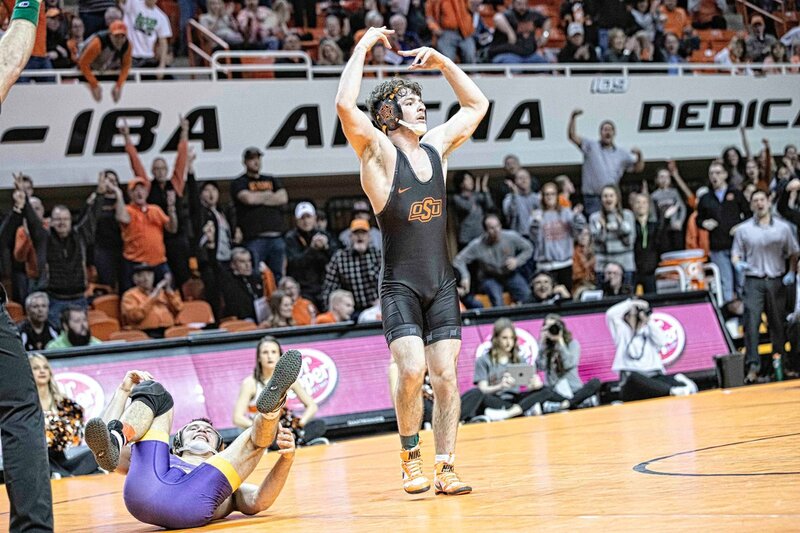 Come out and pack GIA for Friday’s dual against Air Force! It's our Military appreciation match! Military veterans can purchase tickets for $3.00 with the promo code 19wrmilitary at the link below! Cowboys take on Air Force at 7:00 pm tonight in GIA. $3.00 tickets for any veteran (Link above). Come out and cheer on the Cowboys. After tonight, only one more home dual left this year, Iowa on Sunday, February 24th at 2:00 pm. Here is a match lineup and links to watch, listen or follow. 30 minutes until the start. Pretty empty right now. Hopefully a lot more get here as they get off work and make it to town. Starting at 165 tonight. Chandler Rogers is getting the start. Rogers looks rusty but wins 6 to 4. Cowboys up 3 to 0. Christian Bahl getting the start at 174. Joe Smith sitting out. Hopefully for just some rest. Bahl wins his first dual match ever 4 to 3. Cowboys up 6 to 0. Jacobe Smith wins by MD 14 to 3. Cowboys up 10 to 0. Weigel wins in typical Weigel fashion. Escape and riding time with a full period ride out to win 2 to 0. Cowboys up 13 to 0. Will take it for a cold Friday against a meh program. White wins by fall after giving a free takedown clinic! Cowboys up 19 to 0. I leaned over to my son at the start of the White match and told him Derek was going to take the guy right to the brink of a tech and then pin him. My son just stared at me and said he could not believe I called it exactly! Piccininni wins 13 to 6 with a late flurry of takedowns in a match much closer than I anticipated. Cowboys up 22 to 0.